You grasp the Trilogy branded towel hanging from your belt strap, the sweat wicks away easily. The towel is fresh, your clothes are crisp and breezy, your comfort level is at the highest its been stepping into any tournament this year. After a month of practice you know exactly what to do on green, and on the first hole of the day you’ve got a perfect tester. This 24 footer is exactly the shot you’ve been practicing for at home, right down to the Veteran basket matching the one mounted in your backyard. Stepping up to your lie you set your front foot down, perfect. Sitting on your back foot you’re sure to draw your disc in and then drive through your arm slot. Okay, top side off the bogey bar. But you know what happened. You followed through high. You’ll make sure to focus on following through on chains next hole, it’s fine – 53 holes to go, 62 if you count the Final 9 you’re sure to slide right into. But you don’t, and it isn’t fine. Hole after hole to follow you feel like you’re executing perfectly only to experience failure on top of failure. By the midway point you’re only sure of one thing: this is not what you prepared for. By the time you walk off of the course after three rounds of brutality your heart feels like it has fallen into your bowels. What is it that leads even the most dedicated practice putter to fail when the time comes to putt for the money? In short: it isn’t the amount of time spent on the green but how you spend that time that matters. To borrow a quote from the sport of American football and legendary coach Vince Lombardi: “Practice does not make perfect. Only perfect practice makes perfect.” There are varying interpretations of this quote, and to my eyes it is often misinterpreted as a need to practice until mistakes are no longer made. I believe that this interpretation is flawed, and so what we need to answer is: what constitutes perfect practice? In the sport of disc golf I’ve found that following evidence from thought science and learning science are both necessary in developing an appropriate training regimen. From the world of learning science I’ve found particularly poignant the compilation of evidence done by Brown, Roedigger III, and McDaniel in their 2014 book “make it stick: The Science of Successful Learning” which covers a both counterproductive yet widespread tactics as well as strategies that encourage retention of information and skills. From the field of thought science I am not the first to find the work of Kahneman, particularly in his work “Thinking Fast, and Slow” useful: much of his work is paraphrased in the work of athletics trainer Peter Gallwey, the author of the “Inner Game …” series of sports training books. Over a sequence of two articles to come I am going to work to synthesize the work of these authors to develop a theory of practice that will allow you to both analyze your game and then disengage from analysis when executing a throw on the course. Next up will be a focus on theories of learning, followed by theories of thought. I’d like to begin with one important statement: successful learning is, on the whole, difficult and slow. There is no shortcut to successfully developing a new skill. The best putters in the world improve incrementally over the course of multiple years. Each new plateau in skill exhibits the next year’s plateaus in its hot streaks, and so it continues through the limits of your own body’s capabilities in terms of muscle memory. It takes months of practice to reach each of those new plateaus in skill, and earth shattering improvements rarely happen in a single season. The strategies I’m going to elucidate on are not likely to improve your game overnight, but they will improve your game. Let's begin with the types of practice most common among developing putters: massed practice and repetition. 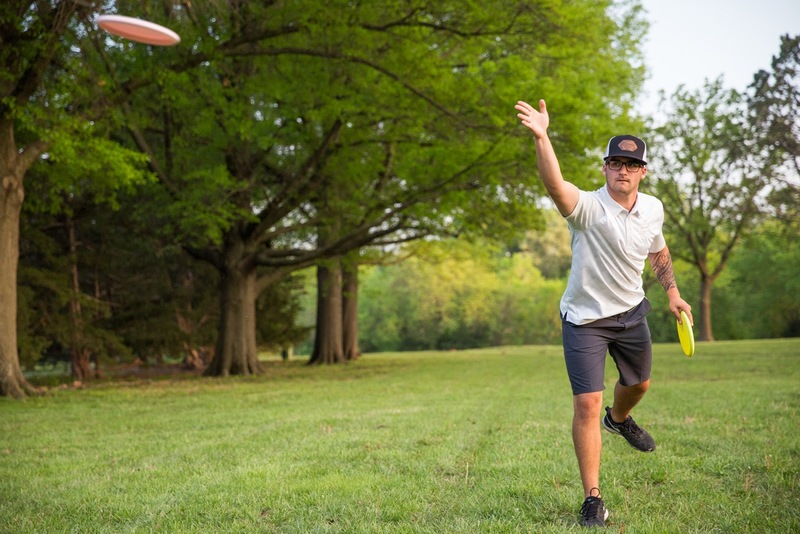 One of the more common complaints that pops up in disc golf’s social media outlets are along the lines of: “I’ve been taking hundreds of putts per day, but ...” Commonly these competitors are chunking their repetitions into massive groups. A new player feels like 15 footers are giving him trouble, and so he repeats those 15 footers for an hour, dropping a couple of hundred putts on the basket from that range until he can mindlessly zip the putter into the basket without thinking about it. By the end of a session the putt feels easy, but when a tournament rolls around the skill seems to wash away like a sand castle at high tide. There’s nothing wrong with taking hundreds of putts per session. But the practice needs to be varied. 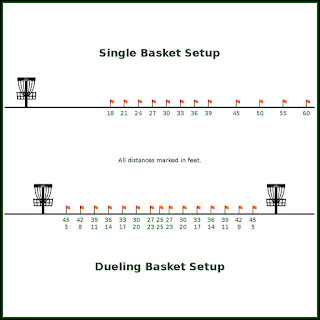 Evidence shows that repetition from a single range must be interleaved with practice that varies the range. Taking 50-100 putts at a time from a single range before moving to another range is beneficial, but the benefits are stronger when one also implements a routine that involves moving putt by putt closer and further from the basket. Contemplate for a moment what tournament golf is like: a golfer does not often take 18 putts on 18 holes all from 25 feet. The body needs to be able to adjust dynamically up and down from 15 footers out to the limits of range. A recommendation would be to set stations up at varied distances from the basket allowing you to move putt by putt in and out in small increments. When out on the practice green take 50 putts from 18 feet, and then break it up by moving in and out for the next 50 before moving to another set of massed putts from a single distance. The benefits may not be as obvious: where you were finishing your massed sets at a single range by zinging in putt after putt and feeling confident and successful, you may find yourself missing quite a bit more often as you move up and down your “ladder” of stations. This is not a bad thing, learners often interpret difficult practice as indicative of an unsuccessful day, but that is rarely the case. Difficult practice is more in line with the mental challenges one will encounter on the disc golf course and develops the resilience necessary to maintain focus on the course through a day of competition. You’ll note that I still recommend sitting back on a single distance and working that distance to perfection. At first glance those sets appear counterproductive, and on their own they are. In one study of children throwing bean bags at a bucket the children practicing a single range (3 feet) were far less successful on tests from 3 feet than children who only practiced from the ranges shorter and longer than that range. When interleaved with varied practice, however, there are definite positive results. These positive results come from the use of those massed sessions as retrieval practice: by using those sessions as ‘pop quizzes’ for your body you improve your ability to recall the muscle memory in the future. Research into learning demonstrates that frequent low stakes quizzing on a particular skill improves retention of the skill over time. This is why, when taking those massed sets, you’re going to want to keep track of how many putts you make. By tracking your numbers you turn every individual putt into a true test of your skill as a player (this is especially true as you build toward 100% numbers at shorter ranges, where a single moment of lost focus means not hitting your target goals). This frequent practice with something small on the line develops the ability to focus when it counts. By making each of those 18 foot putts a must hit, you are again improving your resilience on the course. By coming back to a certain range every couple of days to quiz on it you develop your body’s ability to recognize that it will be called upon to perform a task and perform it successfully. The drive leg is the problem. You’re sure of it. Now that we’ve taken the time to develop the rough outline of a routine for practicing – it’s time to look at how to approach those aspects of the routine from a mental standpoint. Both Kahneman (in “Thinking Fast, and Slow”) and Gallwey (in the “Inner Game ...” series) like to use the numbers “1” and “2” - with Kahneman referring to them as “systems” and Gallwey referring to them as “selfs.” Although I am going to use Kahneman’s work to explain much of what these numbers mean within the realm of thought science, I’m going to focus on referring to them as “self 1” and “self 2” as Gallwey does in his work. This is intended to align more closely with the fact that as competitors we often ‘hear’ the conscious and analytical self as an inner voice instructing our actions. The first of the two selfs, self 1, is the automatic and intuitive you. It uses your learned experiences to perform tasks without much conscious thought. In the everyday world self 1 is used to inform your conscious decisions, guiding you toward the conscious thoughts that you have. In an interaction with another person self 1 would guide you toward immediately recognizing the attitude of that person at a glance before entering into a conversation. While driving self 1 is going to allow you to unconsciously turn the wheel first right, and then overturn the wheel back to the left during a lane shift (to prevent that shift stalling out as a total alteration of direction… into a median). When disc golfing you want self 1 in control whenever engaging in any sort of throw. Self 2 on the other hand should be avoided during the throw in competition. Self 2 is responsible for conscious tasks. 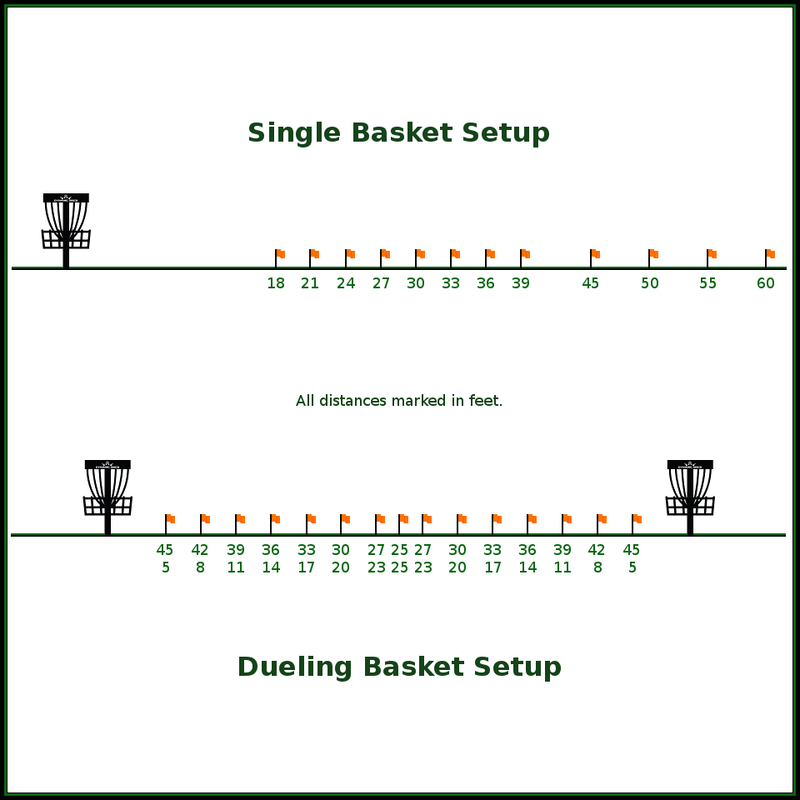 Counting scores after a round requires self 2, as does comparing the value of your prize discs with your voucher total, or determining whether it is worth it to enter a basket toss. It is a very energy intensive way of thought, and as such it blinds a competitor to tasks that would otherwise be unconscious. We often disengage from tasks that engage self 2 without even thinking about it – a good example being when a passenger in a car. When the driver of the vehicle has to pass a large truck in a narrow construction zone, as passengers we often quiet ourselves without recognizing it to allow the driver to focus more consciously on driving as opposed to interpreting our words. On the course, self 2 is going to want to take control of our actions. When putting: self 2 is going to tell you to get your fingers under your putter and pop through; to drive through with the rear foot; to follow through after release. 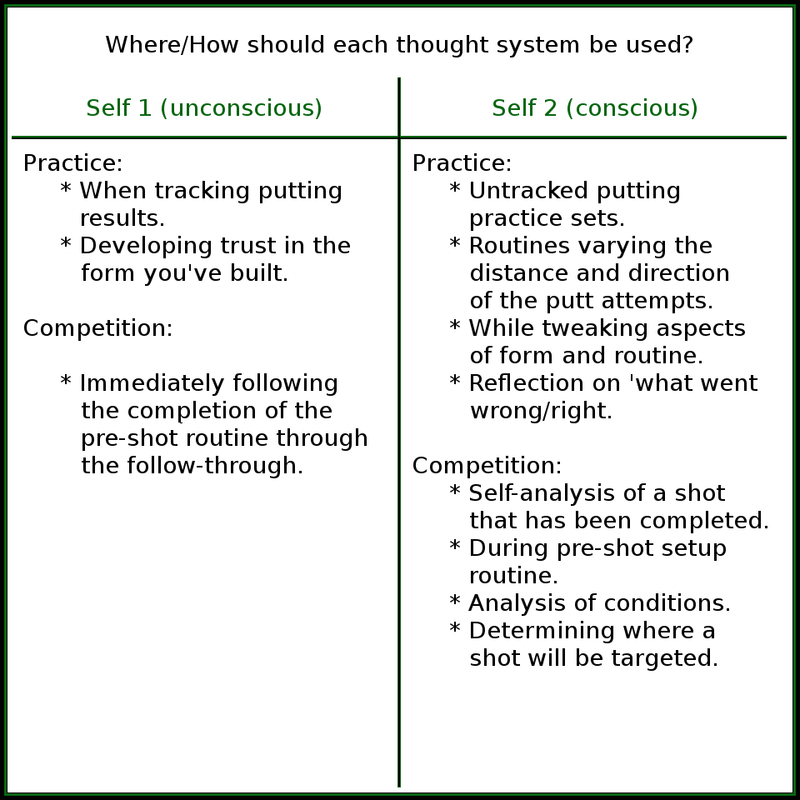 These conscious tasks interfere with self 1’s ability to unconsciously perform in coordination all of the other bits of muscle memory required to successfully make a putt. Despite all of these flaws with self 2, it retains a very important role in practice and rounds if not within a competition throw. This is where I see all routines as requiring a division into two halves. One half of the putting routine should be focused purely on engagement of self 1, and the other half of the putting routine should be focused purely on engagement of self 2. This is because self 2 is the one responsible for mechanical analysis, and without mechanical analysis it is impossible to understand where mistakes are being made. On the course self 2 should be engaged when in between throws, and during the set-up aspect prior to a throw. To go back to learning theory: self 2 is in control of reflection, without which true learning is significantly delayed. During a practice routine it is preferable to engage self 1 during massed practice that is done for the purpose of quizzing and retrieval of muscle memory. When focused on a set of 50 putts from 18 feet, for example, self 2 needs to be completely discarded. What you are practicing when you are attempting to hit 50 out of 50 from the edge of your 100% range is the ability to completely recall your muscle memory without conscious thought. Therefore: there should be absolutely no focus on the vagaries of form. This is the time to learn to trust your muscle memory just as you will in competition. You use these large sets of putts to develop trust in the practice routines that you’ve spent countless hours on. The time for self 2 comes when you’re not engaged in counting makes and misses. For example: when working yourself up and down the ladder of ranges. If you are simply moving deeper and closer based on making or missing putts, you’re going to find that counting makes and misses is almost without a point aside from getting a personal ‘feel’ for your putt. This is a great time to focus on form. If your putts seem to be coming out soft, take the time to analyze and “listen” to your body as you go, noticing whether or not you’re following through or driving off of your rear leg. Use the energy intensive analytical skills of self 2 to your advantage during this part of your session. By necessity engaging in this sort of mental focus is going to make it difficult to make your putts at the high rate of consistency you’ll want for tournament golf, so never count makes or misses while doing it. It is a surefire way to ruin your self confidence as you’ll convince yourself that every aspect of your form has been thought through and you’ll struggle to recognize that by actively thinking it through you’re in essence preventing the sort of muscle memory retrieval necessary for all of those pieces to work with automaticity. To translate this work to the course in competition you’ll want to use self 2 between shots, and discard when performing a competitive action. Competitors with self-confidence problems are often told to not “think so much” when on the course. There are seeds of truth in that, but they ignore the value of setup and reflection in proper execution. The practice with self 1 during the frequent ‘quizzing’ of the muscle memory teaches you to slide into a mental state where your only focus on the green is ‘throw it at that link’ when the time comes to execute. The practice with self 2 allows you to realize in between shots that maybe due to fatigue you started that last putt from your hip instead of your middle abdomen, or failed to get down into an athletic stance to drive off your rear foot. Engagement of self 2 is also vital in pre-shot setup: making sure your toe is pointed in the correct direction, lining up your shot to engage the proper shoulder slot, and so on. 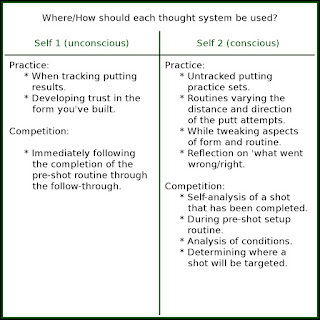 By learning to use both of these forms of thought in practice, through a split putting routine that on one hand allows you to totally engage self 1 without thinking about form at all for the purpose of results and on the other hand analyzing your form while not worrying about the outcome you will learn to switch each form of thought “on” and “off” on the course. This will make you both a more prepared player, as well as a more natural and comfortable player. I hope that this sequence of articles has been helpful for you as a player. Remember that at no point is any of this intended as an edict on exactly how to structure your routine down to the finest detail. This is meant as a guide to what the evidence regarding learning and thought tell us about developing our routines. It is intended to guide you toward developing the routine that best fits your day, your attitude, and who you are as a competitor. Don't practice until you get it right, practice until you can't get it wrong.